Summary: A quantitative description of white matter fiber attenuation, the fiber density index (FDi) is described. This measure is derived from quantitative analysis of diffusion tensor imaging and reveals an index of the number of fiber paths traversing a region of interest. In this report, FDi is computed in 10 patients with glioblastoma multiforme, in white matter that is peritumoral and contralateral. FDi is shown to correlate significantly with fractional anisotropy. Diffusion tensor imaging (DTI) using MR imaging allows identification and characterization of white matter tracts according to the direction and degree of anisotropic water diffusion within them (1, 2). 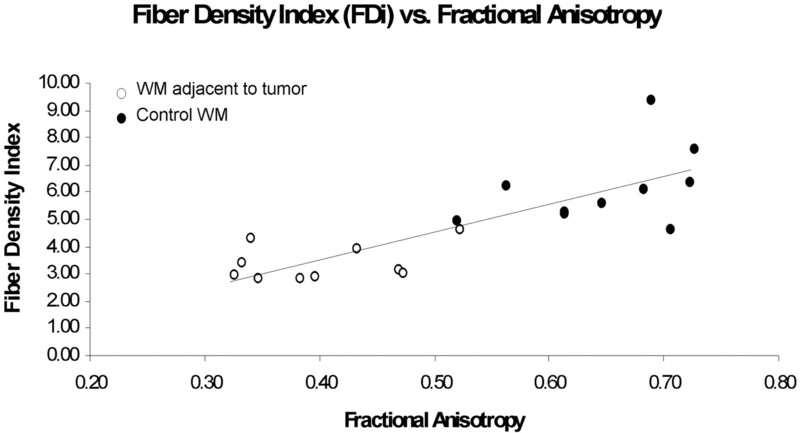 Quantifying the degree of anisotropy in terms of metrics such as the fractional anisotropy (FA) offers insight into white matter development and degradation (eg, in the presence of infiltrating cerebral neoplasm). Additionally, white matter tractography or fiber tracking based on the same data acquisition allows descriptive delineation of white matter fiber paths and their potential displacement by mass lesions (3, 4). Previous studies have shown decreases in FA in white matter in close proximity to invasive lesions, such as high-grade gliomas (5, 6); however, it has not been established whether such a decrease in FA, hypothesized as secondary to tumor infiltration of white matter, is directly attributable to reduced axonal number or density; to degradation of individual fibers (resulting in decreased diffusion anisotropy); or to a combination thereof. In this study, with a view to quantifying the intactness of white matter in the vicinity of tumor, we define a quantity fiber density index (FDi) as an indicator of the density of white matter fibers within the bundle passing through a single pixel or region of interest (ROI). We correlate this measure with the related quantity, FA, obtained from identical ROIs in the immediate neighborhood of glioblastoma multiforme and in control regions of white matter in the homologous anatomic site of the contralateral hemisphere. Ten patients with histologically confirmed World Health Organization-grade IV glioma, (glioblastoma multiforme) underwent a comprehensive MR imaging examination, including DTI. All studies were performed in accordance with the institutional committee on human research. Imaging was performed on a 1.5T clinical MR imaging system (GE TwinSpeed Excite, Release 11.0, GE HealthCare, Milwaukee, WI) equipped with an 8-channel RF head-coil (MR imaging devices). DTI was performed by using 6 noncollinear directions of diffusion sensitization with an echo planar imaging read-out (b-value = 1000 s/mm2, matrix = 128 × 128 in a field of view of 24 cm; section thickness 5 mm). Parallel imaging was employed by using the principles of sensitivity encoding (7) with an acceleration factor of 2, to allow shortening of the effective echo time, TE to 60 ms, with concomitant reduction of magnetic susceptibility artifact. The 6 diffusion-weighted image (DWI) sets as well as the T2-weighted (b = 0) set were spatially registered and postprocessed by using DTI-Studio software (Processing Tools and Environment for Diffusion Tensor Imaging, Version 2, H. Jiang and S. Mori, Radiology Dept, Johns Hopkins University, Baltimore, MD) to generate pixel-wise maps of the FA. Fiber tracking by using the fiber assignment by continuous tracking (FACT) algorithm (8) was then performed, reconstructing all possible fibers through the image set from all pixels above a FA threshold of 0.25, and allowing for fiber angulation up to 70°. Because all pixels with sufficient FA (typically several thousand pixels) are considered as possible sources of fiber paths, it is thus quite conceivable for multiple fiber paths to pass through any given pixel. ROIs (areas of 40–50 pixels) were placed in areas of white matter in close proximity to the tumor and in the homologous area of the contralateral hemisphere. These areas generally encompassed fibers of the corticospinal and corticopontine tracts. These regions were interrogated first to obtain the mean value of FA, and then also to determine the number of white matter fiber paths passing through them. From this latter measure, FDi was constructed by determining the mean number of fiber paths passing through each pixel in the ROI; that is, FDi = number of fiber paths passing through ROI/area of ROI (in pixels). ROIs were placed independently by 3 readers and the 2 quantities, FA and FDi, were independently determined. Concordance between raters for each quantity was assessed by using the intraclass correlation coefficient (9). Individual assessments of the correlation between FDi and FA across the 20 sample ROIs were made by using the Spearman correlation coefficient. Mean values of FA and FDi for each normal-appearing and peritumoral white matter ROI were determined by averaging the corresponding measure from the 3 separate raters, and the correlation between FDi and FA was assessed by using a scatter plot and the Spearman correlation coefficient. Figure 1 shows a representative patient, with a right hemispheric tumor, where fiber numbers (and FDi) are greatly reduced in the vicinity of the tumor (Fig 1A) compared with the corresponding area in the contralateral hemisphere (Fig 1C). FA is also reduced in the ROI adjacent to the tumor compared with the contralateral region. Across all patients, FA was significantly reduced in peritumoral white matter compared with a control region in the contralateral normal-appearing white matter (0.40± 0.02 versus 0.65 ± 0.02, P < .01). Similarly, the FDi showed a significant reduction in the same regions (3.39 ± 0.22 versus 6.11 ± 0.47, P < .01), indicating significantly fewer fiber paths traversing the peritumoral ROI. A representative example of a patient with a right hemispheric glioblastoma. ROIs placed in white matter regions encompassing corticospinal and corticopontine tracts both immediately adjacent to the tumor and in the contralateral hemisphere were interrogated for quantitation of FA and for evaluation of the FDi. Adjacent to the tumor, the number of fibers passing through the region (A) can be seen to be markedly fewer than in the contralateral region (C). The 2 ROIs are displayed without fibers in (B). In this case, peritumoral FA was 0.45, compared with 0.65 in the contralateral normal-appearing region. FDi was reduced from 5.38 in the contralateral white matter to 3.11 in the peritumoral white matter. Note the fiber colors themselves have no specific interpretation. Different colors are assigned to each fiber path as an aid to visualization. Determination of quantities FA and FDi by each of the 3 raters exhibited strong correlation across the 20 sample ROIs (10 normal-appearing, 10 peritumoral) with significant intraclass correlation coefficients of 0.78 (FA) and 0.56 (FDi). Furthermore, the strong correlation between FDi and FA was found independently by each rater (r = 0.70, r = 0.67 and r = 0.70) as well as in the mean (r = 0.81, P < .05), shown in Fig 2. Plot of FDi against FA for all 20 ROIs (10 peritumoral white matter: open circles; 10 contralateral normal-appearing white matter: filled circles). A significant correlation between the 2 parameters is observed (r = 0.81) with both being reduced peritumorally. This Technical Note describes a new quantity, FDi, which represents an indicator of white matter fiber density. FDi is determined in a 2-step fashion. First, fiber paths are reconstructed from all pixels in the volumetric data set with FA values exceeding a minimum threshold (in this study, 0.25). Fiber paths are terminated by decrease in FA below this threshold or by need for angulation exceeding a threshold value (in this study, 70°). This is very different from more conventional approaches in which fiber tracking is initiated from a user-defined ROI. Once this brute-force fiber tracking is finished, an ROI is placed and all fibers (originating from any pixel) that pass through the ROI are displayed. The FDi is then calculated by enumerating the number of fiber paths passing through the ROI and dividing this by the ROI size, to yield a quantity reflecting the “number of fiber paths per unit cross-sectional area.” We interpret this as an FDi. This measure was correlated with the related quantity FA. In normal-appearing white matter and in white matter in immediate proximity to WHO grade-IV glioma, the quantities FDi and FA exhibit a strong correlation (across a wide range of FA values from approximately 0.30 to 0.75). It is anticipated that the further utility of FDi may be established in other settings wherein it contributes to the resolution of ambiguous FA decreases by describing the relative intactness of the white matter in terms of the number of fiber paths passing through, rather than by the average anisotropy of diffusion in the region. This would, for example, help to distinguish between a region of depleted or diluted fibers versus a region whose individual fibers had themselves become less anisotropic (perhaps due to damaged membrane integrity). It should be recognized that FDi does not attempt to count white matter fibers per se, but rather reflects an index of fiber paths passing through a region, the value of which will depend upon factors such as the spatial resolution of the image acquisition and parameters of postprocessing (FA cutoff and angulation threshold). Nonetheless, if these parameters are maintained across a study population, quantitative comparisons of FDi are permitted. Several previous studies have identified diffusion characteristics, and in particular FA, as candidate measures to distinguish infiltrative lesions from those causing anatomic displacement and distortion. For example, Lu et al (10) evaluated whether DTI metrics of peritumoral edema can be used to differentiate intra- from extraaxial lesions, metastases from gliomas, and high- from low-grade gliomas. Metrics used included mean diffusivity (MD), FA, and, a newly introduced quantity, the tumor infiltration index (TII). TII was defined as the difference between expected and observed FA. While MD of metastases was significantly higher than that of gliomas, and TII allowed distinction of tumor-infiltrated edema from vasogenic edema, peritumoral MD and FA showed insufficient difference to distinguish between intra- and extraaxial tumors or between high- and low-grade gliomas. This motivates alternative diffusion-based measures, such as the FDi proposed in the present work. Provenzale et al (11) retrospectively measured the apparent diffusion coefficient (ADC), and FA of peritumoral hyperintense white matter and normal white matter in infiltrative high-grade gliomas and meningiomas. ADC values in peritumoral hyperintense regions for gliomas and meningiomas showed no significant difference. Differences in FA values in these regions approached but did not reach significance. ADCs in normal white matter of these 2 tumor types showed no difference, whereas FA values were significantly different. These results again may indicate a role for diffusion-based imaging in detection of tumor infiltration, but emphasize the need for more specific metrics. Field et al (6) categorized the varied appearances of tumor-altered white matter tracts on eigenvector directional color maps in 13 patients with brain tumors ranging from benign to high grade. Four basic patterns of white matter alterations were identified: (1) normal or nearly normal FA and ADC, with abnormal tract location or tensor direction due to mass displacement; (2) moderately decreased FA and increased ADC with normal tract locations and tensor direction; (3) moderately decreased FA and increased ADC with abnormal tensor directions; and (4) near isotropy. FA and ADC were inversely correlated for patterns 1–3 but failed to discriminate edema from infiltrating tumor. In the absence of mass displacement, infiltrating tumor was found to produce tensor direction changes that were not observed with vasogenic edema. Price et al (12) examined DTI of brain tumors distal to hyperintensities on T2-weighted images (T2 WI) as a function of tumor grade. They found that the abnormality on DTI was larger than that seen on T2 WI in 10/13 patients with glioblastoma multiforme. Another measure of anisotropy, the relative anisotropy index (RAI), in areas of white matter disruption associated with these tumors was reduced, while T2-weighted appearance was normal. These changes were attributed to tumor infiltration. In low-grade tumors, the tumor extent on DTI was identical to the T2-weighted abnormalities. A second study by Price et al (5) characterized diffusion abnormalities in peritumoral white matter tracts of gliomas. Displaced, infiltrated, and disrupted white matter tracts were identified by using FA maps and directionally encoded color maps and characterized by using diffusion tissue signatures (the diffusion tensor is decomposed into isotropic “p” and anisotropic “q” components and these can be plotted as diffusion tissue signatures). Tissue signatures are different for different white matter tracts and are unaffected by displacement of white matter tracts by tumors. Tumor infiltration of white matter fibers causes an increase in p, whereas a reduction in q occurs with disruption of white matter fibers. Such tissue signature analysis appeared superior to FA alone for assessment of tumor involvement of white matter tracts. Beppu et al (13) investigated the correlation between FA changes in tumor and pathologic indices in neurosurgical patients. In 19 glioblastoma patients before biopsy, differences in FA values between normal brain regions and tumor lesions showed a statistical significance. Positive correlation was observed between FA and cell attenuation and between FA and MIB, one tumor labeling index. FA was thus found to be a good predictor of cell attenuation and proliferation activity in this tumor group. Several papers have examined the methodologic considerations in fiber tracking based on DTI. Ciccarelli et al (14) assessed the reliability of diffusion tractography by using 2 different quantitative measurements along the tracts generated by fast marching tractography (FMT): FA and normalized volume of the reconstructed tracts. FMT was used to trace 3 major pathways: anterior colossal fibers, optic radiations, and pyramidal tracts. The highest reproducibility was found in the frontal callosal fibers, followed by optic radiations and pyramidal tracts, suggesting that the fiber organization and the length of the pathway are important factors in determining the level of FMT reproducibility. Basser et al (15) proposed and described a method to compute continuous fiber-tract trajectories from discrete measured DTI data. This was achieved by first constructing a continuous diffusion tensor field from this data and then solving the Frenet equation. This approach was validated by using synthesized, noisy DTI data. Corpus callosum and pyramidal tract trajectories were constructed and found to correlate well with known anatomy. The reliability of this method, however, degrades, where the distribution of fiber tract directions is nonuniform or in the presence of significant background noise. Computation of fiber tract paths is emerging as a useful qualitative and anatomic methodology. Quantitative analysis of DTI in terms of parameters such as FA appears to offer promise for distinguishing infiltrative from noninfiltrative tumor, but with some sensitivity limitations. The proposed measure, FDi, adds a quantitative property to the fiber-tracking methodology, and thus augments the capabilities of regional FA alone. In the present context of high-grade tumors only, both FA and FDi describe abnormalities of peritumoral white matter. In these regions as well as normal-appearing white matter, the new index, FDi, appears well correlated with FA. Given these quantitative strengths, we propose that FDi and FA in combination may offer superior description of a range of white matter pathologies. Accepted after revision April 25, 2005.